Philadelphia, last in the NL East, had won two straight coming in but lost for the 10th time in 13 games. Toronto broke through against Phillies right-hander Vance Worley (3-3) with consecutive two-out doubles in the third. Rookie right-hander Drew Hutchison left in the first inning with a sore elbow but five Toronto relievers combined on a five-hitter as the Blue Jays beat the Philadelphia Phillies 3-0 on Friday night, snapping a three-game losing streak. Brett Lawrie had two doubles and drove in a run as the Blue Jays won for just the third time in their past nine meetings with the Phillies. Hutchison became the third Blue Jays starter in five days to leave with an injury when a sore right elbow forced him off the mound after just nine pitches. Aaron Laffey worked 1 2-3 innings, Carlos Villanueva earned the win by pitching four innings, Jason Frasor and Darren Oliver each worked one inning and Casey Janssen pitched the ninth for his sixth save in seven chances. Villanueva (2-0) allowed two hits, walked two and struck out five. Before the game, the Blue Jays announced that an MRI on right-hander Kyle Drabek revealed a torn ligament in his elbow. Drabek, who had ligament replacement surgery as a minor leaguer in 2007, is due to visit noted surgeon Dr. James Andrews on Monday to confirm the diagnosis. Drabek, who left in the fifth inning of Wednesday's loss to Washington, was placed on the 15-day disabled list and left-hander Brett Cecil was recalled from Triple-A Las Vegas. Cecil will make his season debut Sunday against the Phillies. Adding to Toronto's woes, right-hander Brandon Morrow left Monday's loss to the Nationals after nine pitches with a strained muscle in his left side. He was later placed on the 15-day DL. Toronto broke through against Phillies right-hander Vance Worley (3-3) with consecutive two-out doubles in the third. Rajai Davis doubled to left and Lawrie followed with an RBI double to right. 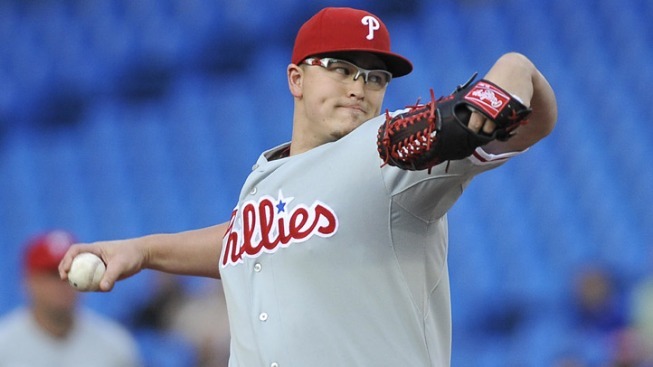 The Blue Jays took advantage of an error by Phillies third baseman Mike Fontenot to add two runs in the fourth. Jose Bautista led off with a single and Edwin Encarnacion followed with a broken bat grounder to third. Fontenot's throw sailed wide of second base and into foul territory in right field, allowing Bautista to score as Encarnacion advanced to third. One out later, Encarnacion scored on Yunel Escobar's groundout. Fontenot's error was the 13th by the Phillies in their past nine games. Worley allowed three runs, one earned, and five hits in seven innings, matching his longest start of the season. He walked two and struck out five. Philadelphia catcher Carlos Ruiz left in the seventh inning with a strained muscle in his left side. He was replaced by Brian Schneider.